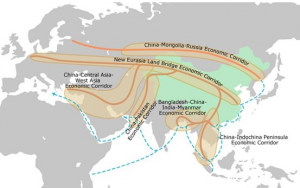 Changing aspects for international business and trade resulting from China’s “Silk Road Initiative” effecting some 60 countries; and meetings between chambers of commerce representing the Silk Road countries and representatives from regional chambers of commerce will take place April 2 and 3, 2019 and participate in sessions of the 2019 Silk Road Conference scheduled in Chicago on Wednesday, April 3, 2019. Private meetings between representatives from business, government, and academia are scheduled on Monday and Tuesday, April 1 and 2, will conclude with the annual Silk Road Conference scheduled from 8 AM until 5 PM, , at IIT’s Kent College of Law Auditorium, 565 W. Adams St., Chicago. Organized by the Central Asian Productivity Research Center, founded in Azerbaijan and Turkey in 1999, the event is co-sponsored by the Global Programs, College of Business, Northern Illinois University. Qualified attendees can attend free of charge, but advanced registration is required. Almost thirty speakers and panelists will focus on the rapidly changing region that is described by a former undersecretary of defense as a very important strategic region for the US.